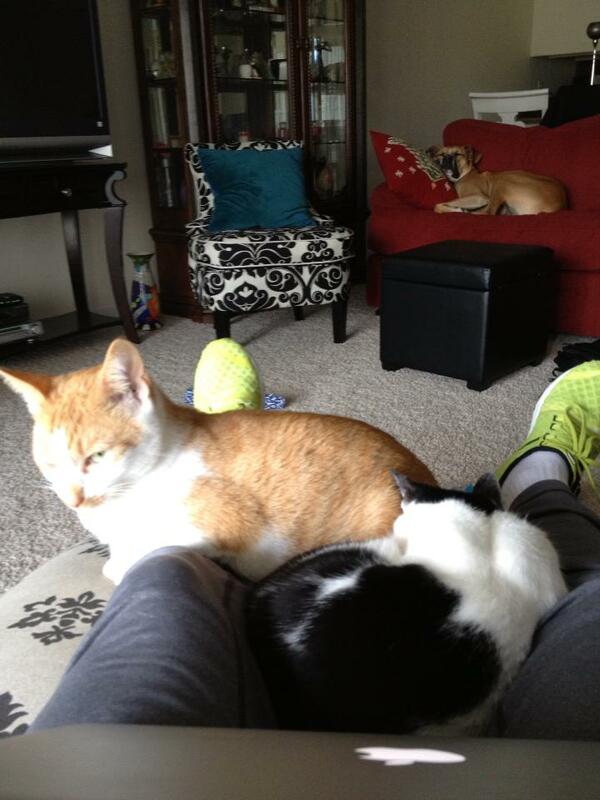 After yesterday’s ordeal of driving in an ice storm, I was ready for a good workout today. 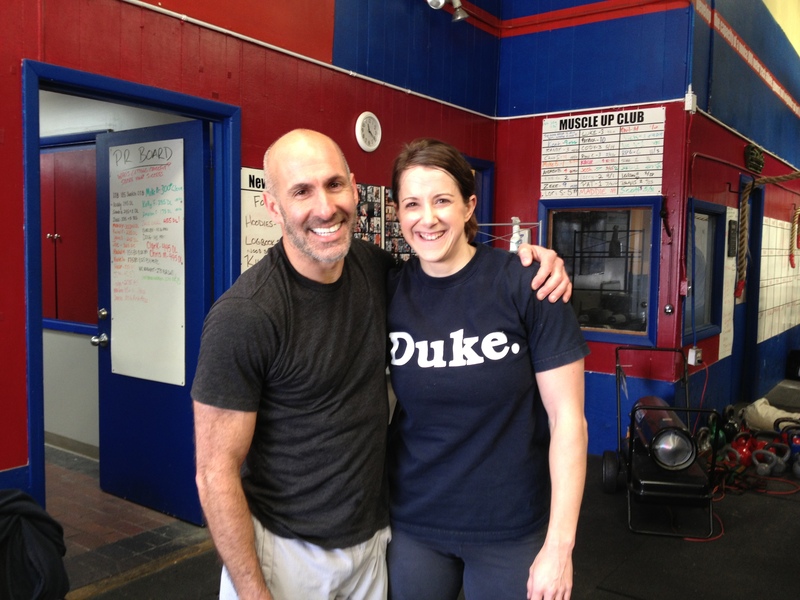 As I often do while in Wilmington, I joined my very good friend Kelly and worked out at CrossFit Coastal. Kelly’s husband, Scott is one very lucky man. There were about 20 people present (and I later learned that this was also the Community WOD) and we completed a partner WOD. As Kelly partnered with her daughter, Ameron, I partnered with Lori. We made a very good team. The instructions were somewhat confusing, but Lori I and figured it out and determined our strategy. We began with Station #3, then completed #2 and finished with #1. Each partner had to do all reps, e.g., both partners had to row 750m, and only one partner could be working at a time. Lori and I couldn’t find a set of bar clips. Given this, I didn’t even consider doing the prescribed weight for men and instead decided to share a bar with Lori set my goal to do fast reps. Oh, our strategy was to do sets in as many reps as we were comfortable doing. This generally worked out well. Lori began and completed 15 OHS. I completed 30 unbroken reps, but as the weight was very light this isn’t really that much of an accomplishment. I do, however, now very much enjoy squatting with the bar over mah head. I completed rings dips in 4 sets of 10 reps and 2 sets of 5 reps. Fifty rings dips is a helluva lot to do in any workout. I began with the row, and we both rowed in 3 sets of 250m. We completed FS outside and had to spend some time putting weight and clips on the bar. I think not doing cleans for do long truly was for the best, as my form has suddenly dramatically improved. And I’m pain free! Thrusters also felt very light, and I completed in 3 sets of 10 reps. I also completed 3 sets of 10 reps of burpees, and when Lori completed her 30th burpee I mistakenly yelled “Time!” Uhm, we were to each do 50 burpees. I did another 10, as did Lori. I had told her that I loved burpees. Lori informed me, well, that she did not love burpees. I’m beginning to think that I may be only person who loves burpees. 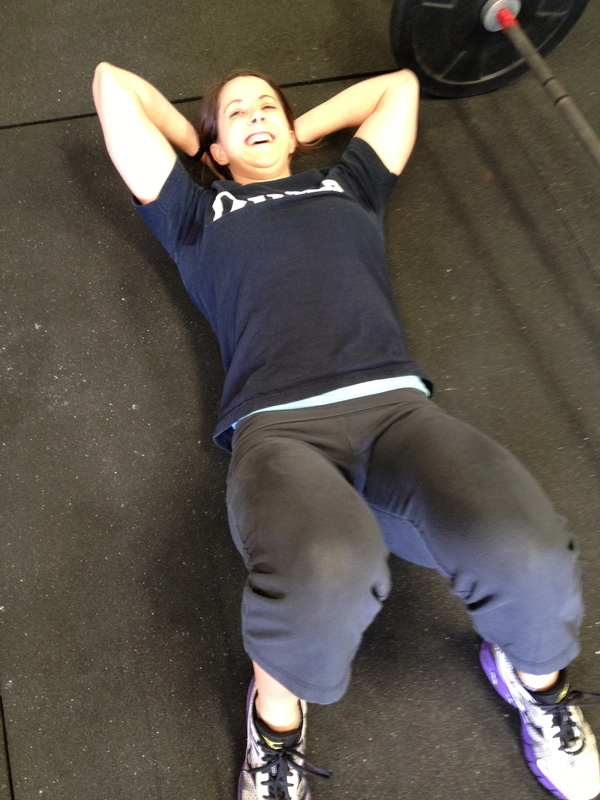 Lori completed her 40th burpee. I glanced at the clock at it read 28:33. I did my last 10 burpees and once again glanced at the clock. I read 28:53. Lori only had 20 seconds of rest. I nonetheless encouraged her to start right away. 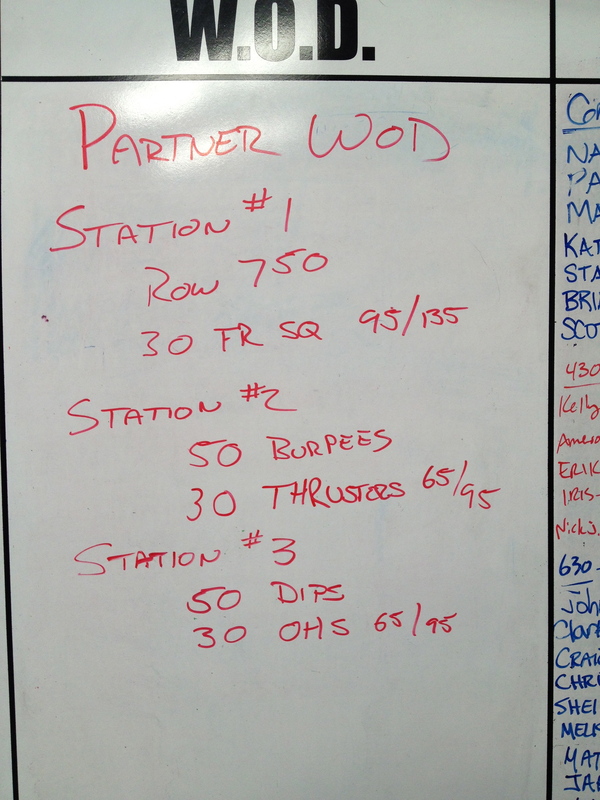 (I can only imagine how awful it must be to be my partner for a WOD. Sorry, Lori!) Lori finished her 50th burpee and I once again yelled “Time!” The clock read 29:38. We had 22 seconds to spare! 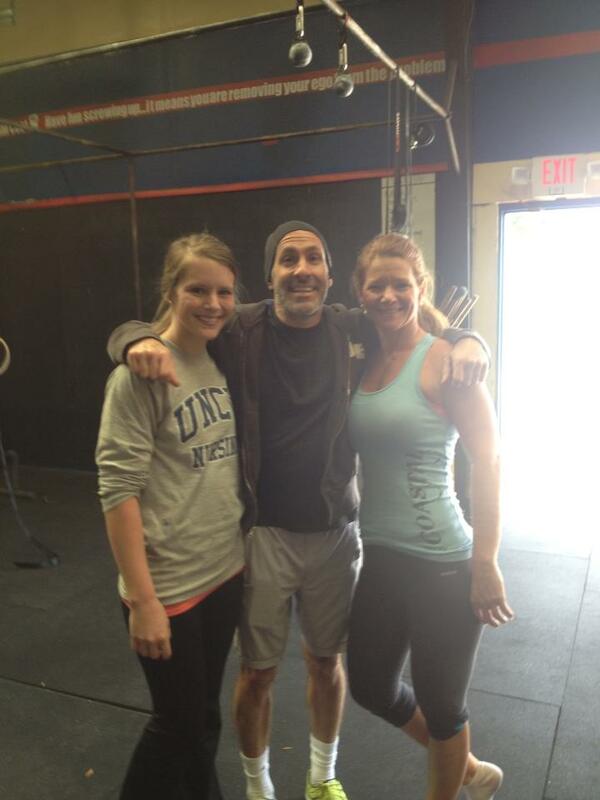 As Lori and crushed this WOD, I had time to observe and coach the Kelly and Ameron on FS. Remember, hips forward and drive out the knees. Jeff is attending the Level 1 cert, and Kelly, Ameron, and I met him for lunch. He appears to be enjoying himself, although he’s dreading “Fran”. Both Kelly and I have pumpkin butts, and we’re proud of it.